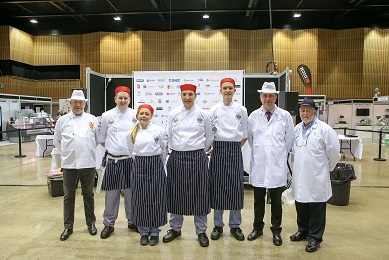 Four talented young butchers showcased their skills at Meatup, in a fight to win the title of Premier Young Butcher 2017, a competition hosted by the National Federation of Meat and Food Traders. After an exhausting day James Gracey, of Quails Butchers, Northern Ireland, emerged triumphant. James who studies with Southern Regional College, saw off competition from Jack Eagles of C Lidgate of London, Elsie Yardley of Hards of Halstead and Thomas Lea of Walter Smith, who was declared runner-up.